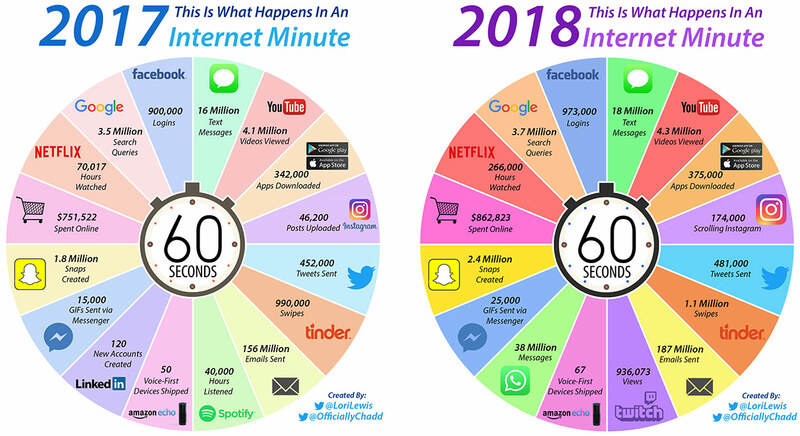 Do you know what happens on the internet in one minute? It’s hard to even wrap your head around it, which is why All Access created this pie chart. The jump in numbers from 2017 to 2018 is staggering. Two million more text messages sent. 29,000 more tweets posted. 195,983 more hours of Netflix watched (195,982 of those are due to our binging). This is all to say: you’re competing for mindshare, and the competition is fierce and rapidly evolving. Create compelling content and you’re in the game. Last year, Nike completed its Breaking2 project. The goal was to see if it was humanly possible to break two hours in the marathon. Going into the event, the fastest marathon on record was 2:02:57. Shaving off nearly three minutes across 26.2 miles is a Herculean feat. Nike invested years of research and developed advanced technology to give the world’s fastest distance runners their best chance. Then, Nike partnered with National Geographic on a documentary of the project. The film is awe-inspiring, unbelievable, heartbreaking—and heartwarming. And I want more Nikes. You don’t need to invest millions of dollars like Nike did, but creating content—even when it isn’t directly tied to selling something—builds loyalty and gives your customers an emotional connection to your brand. Knowledge is power, and both prospects and existing customers benefit from more of it. Whether you have an esoteric product or service or you’re selling No. 2 pencils, you’re the expert. Spread the wealth. What are the best uses of your product? When should customers order your service? The fun part is you can get creative with the editorial, design, and delivery method. What else can you do with pencils besides write? Repel moths, apparently. Google is really smart. It knows when content is useful and when it’s just saturated with buzzwords for SEO’s sake. Creating relevant, insightful content is one of the best ways to improve your ranking and more easily show up in search results. Search engines are constantly evolving (Google changes 500–600 times a year), so continuously giving them useful and relevant content will help you remain in the good graces of the all-powerful algorithm. Finally, increasing revenue or gaining new members should be one of your goals. These days, the sales journey is less like a funnel and more like a maze. Think about the last time you bought a new product. Maybe you saw someone wearing a hat you liked. Then that brand happened to pop up in your “search” tab on Instagram. You visit its page and liked a couple of posts. Then you start seeing its ads, so you went to the brand’s website. The imagery is aspirational, the blog—inspiring, the products—top of the line. Now you want the hat, a hoodie, and every shirt. When you order, you also register for their email newsletter. You follow the account on IG and when your goods arrive, you post a story of yourself opening up the package. You’re creating user-generated content for the brand. They view your story and now you’re a loyalist.For Millenials and Gen Z, this can be a typical route to the sale. In this case, content marketing can almost be thought of as “engagement marketing.” As a marketer, you touch all stages of the sales process. How will you engage your customers?